The week opened with a positive report on industrial production. The .8% rise offset Janary’s decline and was the 4th month in which this index has been above the level of late 2007, the onset of the last recession. To give the reader a sense of historical perspective, this index of industrial production has been produced for almost hundred years. The average recovery period of civilian production is 2-1/2 years. 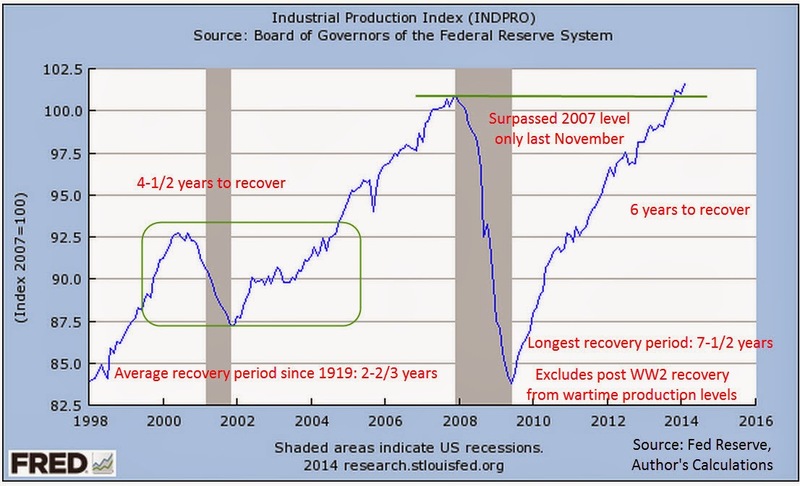 This recovery period of this past recession, 6 years, is second only to the 7-1/2 year recovery of the 1930s Depression. I have excluded the 6-1/2 year post WW2 recovery period from war time production, which doubled production to produce goods and armaments for the war. If that period is included, the average is 3 years. 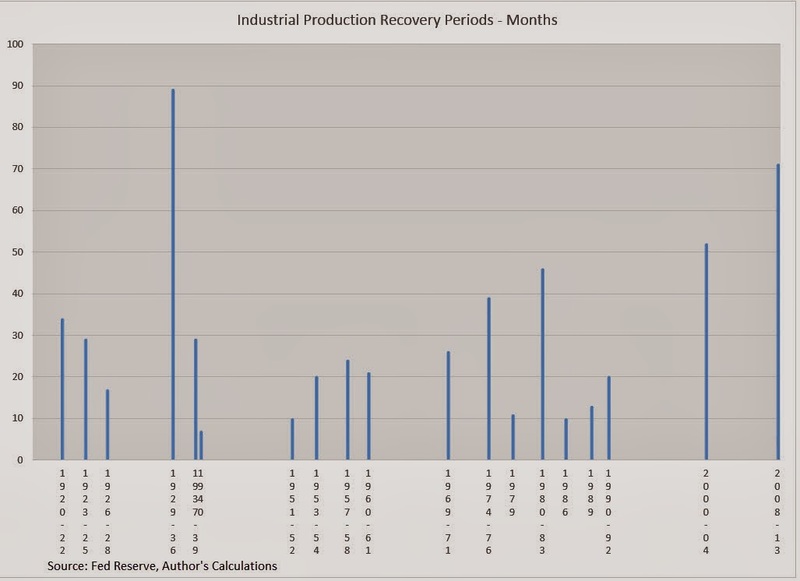 Here is a comparison of the recovery periods since 1919. The back to back dips of 1979 and 1980-83 were, in effect, one long dip lasting 4 years, making it the third worst recovery period of the past one hundred years. When industrial production takes several years to regain the ground lost during a recession, it is vulnerable to even minor economic weaknesses. 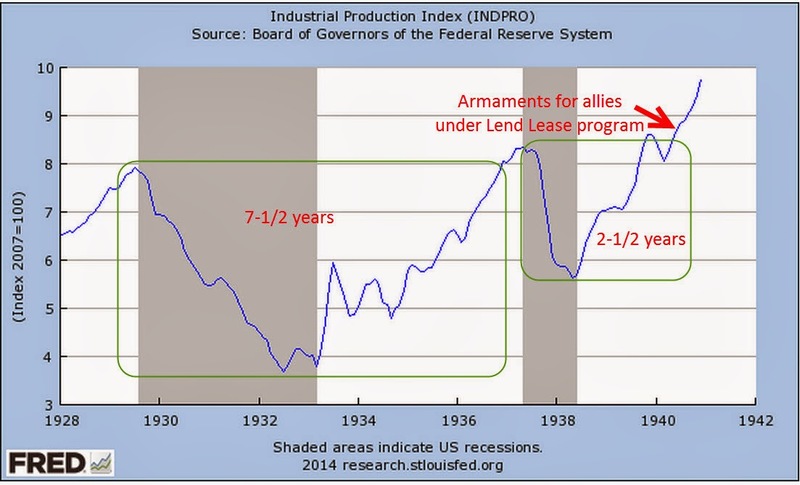 As production recovered from a 7-1/2 year dip during the 1930s Depression, the Federal Reserve tightened money and production slid once again before reviving to produce arms to ship to British and European forces in the early years of World War 2. Outgoing Federal Reserve chairman Ben Bernanke, a noted scholar of the 1930s Depression, understands the inherent weakness of an economy when production takes several years to recover. For this reason, he was reluctant to ease up on monetary support until production was clearly and securely recovered. The new Federal Reserve chairwoman, Janet Yellen, has decades of experience and is well aware of the fragility that is inherent in an economy that experiences a long period of industrial recovery. This will be one of several factors that the Federal Reserve watches closely for any signs of faltering. Those who think that the Fed will make any abrupt changes in monetary policy have not been reading the footprints left by the past. 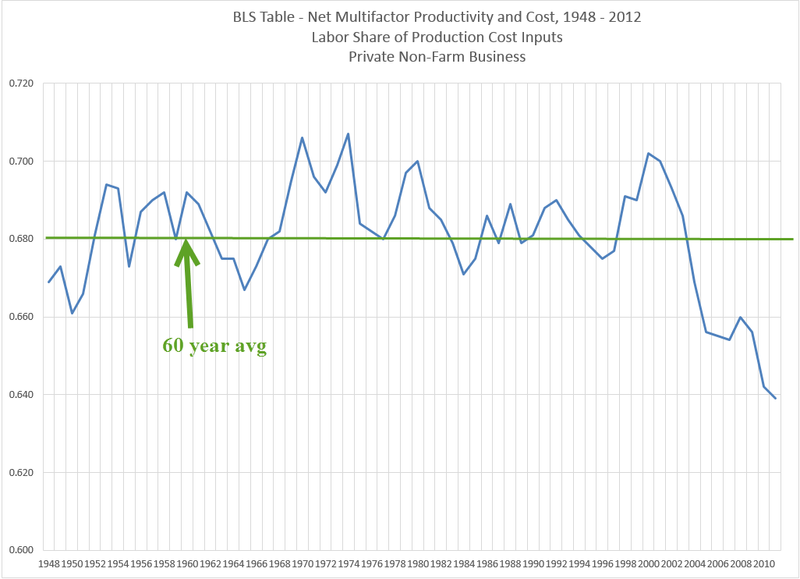 Last August I wrote about the rather slow growth of multi-factorial productivity (MFP) since 2000. The Bureau of Labor Statistics (BLS) calculates a meager 1% annual rate of growth in that time. Far down in their historical tables is a revealing trend: Labor’s contribution to production has declined dramatically in the past ten years while capital’s share of inputs has increased. Capital inputs include equipment, inventories, land and buildings. In 2011, the most recent year available, labor’s share of input had decreased to 63.9%, far below the 60 year average of 68.1%. 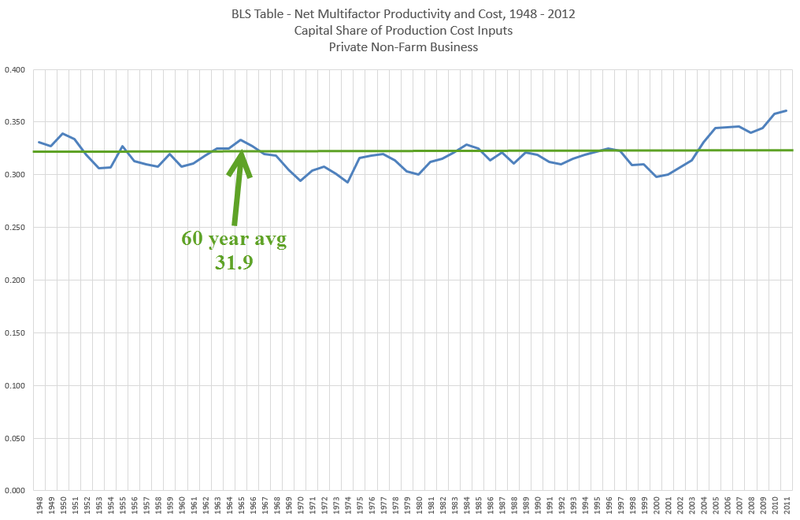 As I mentioned last August, the headline productivity figures are misleading because they simply divide output by number of hours worked and ignore the contributions of capital to the final output. As capital’s share of input increases, the contributors of that capital want more return, i.e. profit, on their increased contribution. In the twelve years from 2000 – 2011, capital’s share of input has increased 20%, from 30% to 36%. 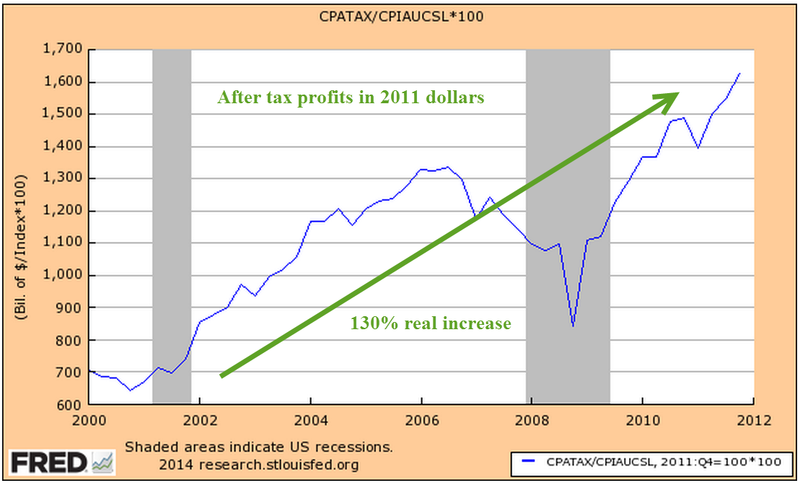 In that same period, after tax profits have grown by 130%, a whopping return on the additional 20% capital invested. While overall MFP growth has slowed, the mix has changed. Given such a rich return, we can expect this trend to continue until the growth of profits on ever larger capital investments reaches a plateau and slows. Until then, labor’s share of productivity gains will be slight, acting as a continuing restraint on family incomes. The 5 million sales of existing homes in 2013 was 9% above 2012 levels but the percentage of cash buyers has increased as well, now making up almost 1/3 of existing homes sales. (National Assn of Realtors). The percentage of first time buyers declined from 30% in December 2012 to 27% in December 2013. For the past half year sales of existing homes have declined and the latest figures for February show a 7% decline from 2013 levels. In May 2013, the price of Home Depot’s stock hit $80, a 400% rise from the doldrums of the spring of 2009. Since then, it has traded in a close range around that price. In May 2013, the price of the stock was 200% of the 4 year average, an indication that all of the optimism had been baked into the stock price. It now trades at 160% of the 4 year average, rich but more reasonable if expectations for a continued housing recovery materialize. In January 2000, the stock broke above $50 and was also trading at almost 250% of it’s 4 year average. After trading in a range in the high $40s for several months, the stock began to fall. By mid-June of 2000, the stock traded for 150% of its 4 year average. The range bound price of Home Depot’s stock price for 8 months now is a good indication that investors have become watchful of the real estate sector, particularly the existing home market. The percentage of cash buyers has risen 10%, replacing the similar decline in the number of first time home buyers. Remember that this stalling is taking place at a time when interest rates are near historic lows. A reader posed a few questions about last weeks blog. When annualized sales rates are down, but annualized inventory rates are up, is that usually because of prior contracts that businesses must accept? Or is it usually hope for their future? In other words, is a higher inventory rate a positive sign or a negative one? When sales are going down and inventories are going up, it means that businesses were not prepared for the change in sales. This ratio measures the amount of surprise. Businesses will then reduce their orders to factories, wholesalers, etc. They may decide to reduce any hiring plans. On the other hand, they might increase their marketing expense. 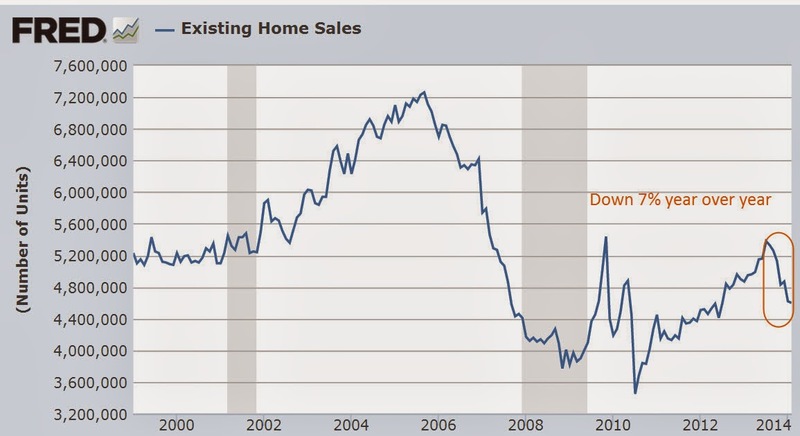 Look closely at the Inventory to Sales Ratio (ISRATIO) graph from the Fed. In the early part of the recession in the first quarter of 2008, the ISRATIO moved up a bit, then down in the 2nd quarter but it was still in the subdued normal range of 1.25 to 1.30 established since 2006. During the summer of 2008, the ISRATIO rose again but it was not until September 2008 that this ratio began it’s several month upward spike as sales crashed. Re: Decline in real personal consumption below 2.5% has ALWAYS led to a recession within a year. Are there any substantive changes in how the economy is run now than in the past? For example, has the Fed always been involved with quantitative easing like it is now? Could that easing create a better economic climate despite personal consumption decline? When we look at the past, are we generally comparing apples to apples? The fact that a recession has always happened when inflation adjusted personal consumption falls below 2.5% does NOT mean that it will happen this time. These are indicators, not predictors and we must remember that indicators of past trends are with revised data. Investors and policy makers must make decisions with the currently available data, before it is fully complete. Personal consumption for 2013 could be revised higher in the coming quarters. Some revisions happen as much as three years later. What it does mean is that the Fed will be watching this sign of weakness in the consumer economy and is unlikely to make any dramatic policy changes. So how do you think our leaders should lead in regards to SS? Do you think the age should be raised to say 70? Do you think we will not be able to depend on SS being there throughout our lifetimes? It must be of great concern to your kids that it may not be there for them, esp. after having contributed over the years. I think politicians will have to spread the pain on Social Security. These suggestions are not new. 1) Raise the salary level that is subject to the tax so that more tax is captured from higher salaries. This years maximum is $117K. (SSA) This is a tough sell. 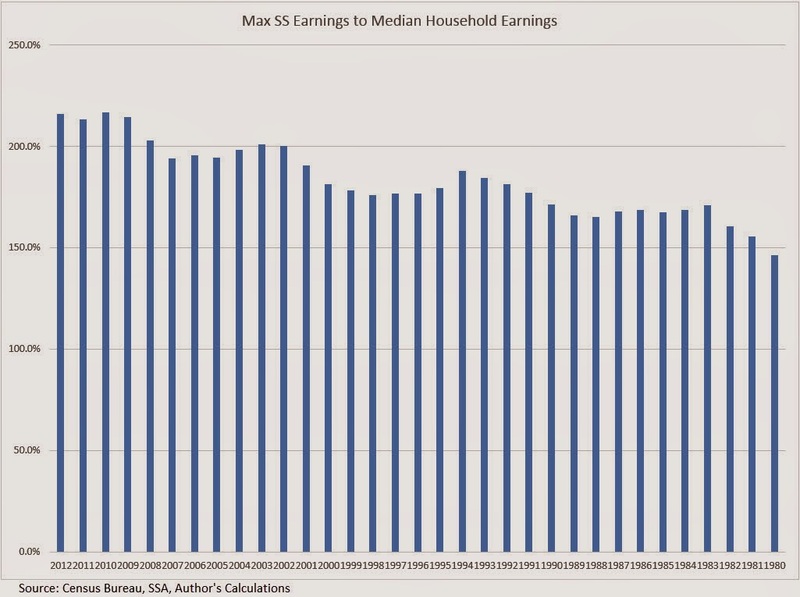 The ratio of the maximum taxed earnings to the median household income (Census Bureau Table H.6) has gone up from 150% in 1980 to almost 220% in 2012. Well to do people feel like they are already paying their “fair share.” Senator Bernie Sanders and other Democrats use the ratio of the maximum taxed earnings to the top 10% of incomes to make the case that the maximum should be as high as $175K. Computers and the availability of so much data enable policy makers and think tanks to produce whatever data set they want in order to support their conviction. 2) Raise the employee and employer share of the tax .1% each year for the next five years. Democrats will not like this one because it raises the burden on lower income families. 3) Initially raise the social security age by two months each year over the next five years and index it to the growth in the life expectancy of a 65 year old so that the official retirement age is 15 years less than the life expectancy. In 2025, if the life expectancy is 85 years, then the official retirement age would be 70. Early retirement should be set at 3 years less than full retirement age. In this case, early retirement would be 67. All of these are tough choices and most politicians don’t want to touch them. Voters are not noted for their prudence and are unlikely to pressure pressure policy makers for more taxes and less benefits. In order to sell these difficult proposals, I would add one more proposal. 4) Guarantee the payout of benefits for ten years, regardless of death. Each retiree would name beneficiaries for their social security and payments would go to those beneficiaries until the 10 year anniversary that retirement benefits began. This would incentivize retirees who could afford it to delay the start of their retirement benefits until 70, knowing that their heirs would get at least ten years of benefits. This delay would ease some of the fiscal shock as the boomer generation is now retiring. Currently, the highest social security benefit is paid to a surviving spouse. If a man dies with a higher monthly benefit than his wife, then the wife gets the husband’s higher benefit amount each month but loses her benefit. Under this proposal, the wife would get her benefit and the husband’s benefit plus her benefit if her husband dies within ten years of retirement. Often, a couple’s income is cut in half or by a third when a spouse dies. Older women are particularly impacted, finding that they can no longer afford the mortgage or rent in their current housing situation. This feature would enhance the popular understanding that Social Security is like an insurance annuity. It would help particularly vulnerable older surviving female spouses, an emotionally appealing feature that politicians could sell to voters, thus making it more likely that voters would accept the higher taxes and raised retirement age. Whether the idea is fiscally sound is something that the Board of Trustees at the SSA could calculate.